The three Chinese astronauts currently in orbit aboard a prototype space lab module received a special call Tuesday (June 26) from China's President Hu Jintao, according to news reports. The Chinese president extended well wishes and spoke to the spaceflyers about the progress of their mission from the Beijing Aerospace Control Center, reported the state-run Xinhua news agency. "You have spent nearly 10 days in space, we care about you," Hu said, according to Xinhua. "How are you feeling?" Mission commander Jing Haipeng, who flew in space once before in 2008, said the crew is in good spirits and is excited about the mission. "Chinese astronauts have their own home in space now," Jing told the president. "We are proud of our country!" 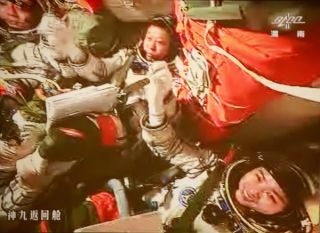 The crew, which includes Jing, Liu Wang and Liu Yang, China's first female astronaut, launched into orbit on the Shenzhou 9 spacecraft June 16. Two days later, the spaceflyers made history by automatically docking their spaceship with the Chinese Tiangong 1 test module, in what was China's first manned docking in orbit. On June 24, the astronauts manually docked the Shenzhou 9 spacecraft to Tiangong 1, to demonstrate the country's ability to perform both automatic and manual linkups in space. The crewmembers are expected to remain in orbit for 13 days before returning to Earth. The successful space dockings represent a significant technological step toward China's goal of constructing a space station in orbit by the year 2020. It also established China as only the third nation, after the United States and Russia, to pull off such a maneuver. During the special call, Hu asked about the experiments being performed on Tiangong 1, and praised the spaceflyers for their contributions to the future of the country's ambitious space program. "We and your families are looking forward to your successful and safe return," Hu said, reported Xinhua. The Tiangong 1 test module launched into orbit in September 2011. An unmanned vehicle, Shenzhou 8, lifted off in November of that year and completed China's first unmanned, automated space docking. China is aiming to build a 60-ton space station in orbit by the year 2020. The country also intends to one day land astronauts on the moon, and return lunar samples to Earth by 2016 using a robotic spacecraft.